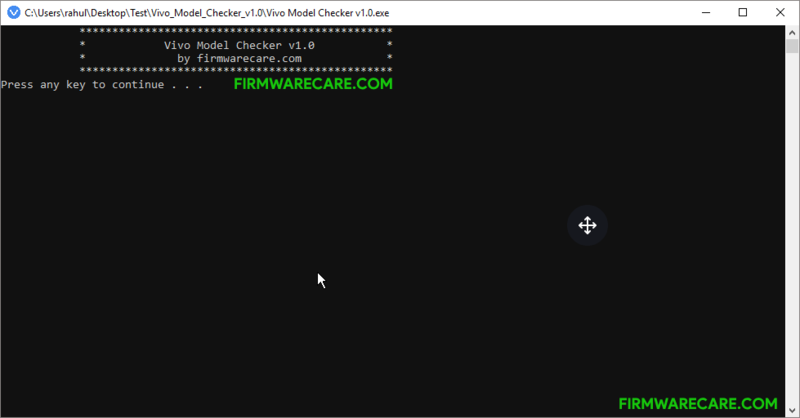 Vivo Model Checker v1.0 is a small application for windows computer created by firmwarecare.com, which allows you to check the Model number of your Vivo Smartphone and Tablets in a single click only. It only supports Vivo devices, if you are using any other mobile brands other than Vivo then it might not work for you. Vivo Model Checker v1.0 comes with simple and easy to use interface which allows you to get the complete information about your Vivo Smartphone and Tablets in a few seconds only. You can easily get the Model number of your Vivo device. Since, Vivo Model Checker v1.0 is an open source tool. You may use it free for always. In order to use the Vivo Model Checker, you need to install the Universal ADB Driver on your computer. [*] Compatibility: The Vivo Model Checker runs perfectly on Windows XP, Windows Vista, Windows 7, Windows 8, Windows 8.1 and Windows 10 (32 bit and 64 bit). [*] Credits: Vivo Model Checker is created and distributed by firmwarecare.com (developer). So, full credits goes to firmwarecare.com (developer) for sharing the tool for free.